If you’ve seen the next Mar’s rover, named Curiosity (part of the Mars Science Laboratory–or MSLas it’s called for short), you’ve probably noticed that it’s does not have solar panels, and that’s because it does not need them. NASA has opted for a more reliable miniature nuclear battery to serve as Curiosity’s main power source. A few days before the rover’s scheduled launch on November 25, NASA scientists will install the Multi-Mission Radioisotope Thermoelectric Generator. The generator is equipped with thermocouples that convert the heat generated from the natural decay of the plutonium dioxide into electricity. By the mid-1950’s, research had begun in earnest on ways to use nuclear power in space. These efforts resulted in the first radioisotope thermoelectric generators (RTGs), which are nuclear power generators built specifically for space and special terrestrial uses. These RTGs convert the heat generated from the natural decay of their radioactive fuel into electricity. The low-power devices were designed to supplement a craft’s primary non-nuclear power source, but as the technology progressed, they soon began shouldering many missions’ entire power needs. Although other radioactive fuels have been considered for RTGs, plutonium-238 (Pu-238) has been used most widely. 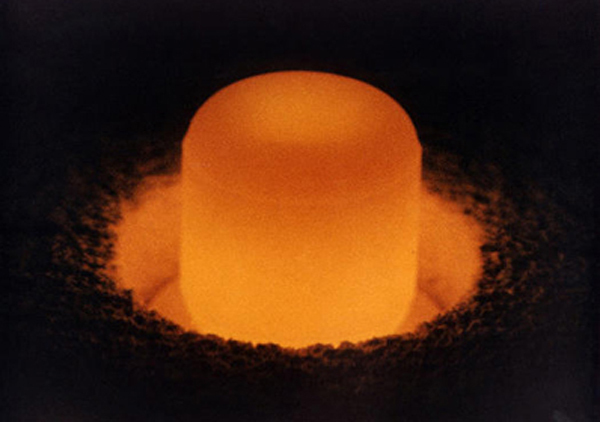 Pu-238 is a radioactive isotope — a form of plutonium that gives off energy as rays and particles. It continues to be the radioactive fuel of choice today and in planned future missions. Polonium-210, which was used in the early SNAP-3 RTG, has a half-life of 138.4 days. At the end of that time, the amount of radioactive material remaining is half of the original amount. This means there is only half the heat available for conversion into electric energy. Longer space missions require a radioisotope with a longer half-life. Pu-238, with its half-life of 87.7 years, fills the need. For example, after five years, approximately 96 percent of the original heat output of Pu-238 is still available. A even-numbered series of compact nuclear reactors primarily developed for the U.S. Government by the Atomics International division of North American Aviation. SNAP Experimental Reactor (SER) was the first reactor to be built by the specifications established for space satellite applications. The SER used uranium zirconium hydride as the fuel and eutecticsodium-potassium alloy (NaK) as the coolant and operated at approximately 50 kW thermal. The system did not have a power conversion but used a secondary heat air blast system to dissipate the heat to the atmosphere. The SER used a similar reactor reflector moderator device as the SNAP-10A but with only one reflector. Criticality was achieved in September 1959 with final shutdown completed in December 1961. SNAP-8 reactors were designed, constructed and operated by Atomics International under contract with the National Aeronautics and Space Administration. Two SNAP-8 reactors were produced: The SNAP 8 Experimental Reactor and the SNAP 8 Developmental Reactor. Both SNAP 8 reactors used the same highly enriched uranium zirconium hydride fuel as the SNAP 2 and SNAP 10A reactors. The SNAP 8 design included primary and secondary NaK loops to transfer heat to the mercury rankine power conversion system. The electrical generating system for the SNAP 8 reactors was supplied by Aerojet General. Five SNAP-27 units provided electric power for the Apollo Lunar Surface Experiment Packages (ALSEP) left on the Moon by Apollo 12, 14, 15, 16, and 17. The fuel capsule, containing 3.8 kilograms (8.4 pounds) of plutonium-238 in oxide form (44,500 Ci or 1.65 PBq), was carried to the Moon in a separate fuel cask attached to the side of the Lunar Module. The fuel cask provided thermal insulation and added structural support to the fuel capsule. On the Moon, the Lunar Module pilot removed the fuel capsule from the cask and inserted it in the RTG. These stations transmitted information about moonquakes and meteor impacts, lunar magnetic and gravitational fields, the Moon’s internal temperature, and the Moon’s atmosphere for several years after the missions. After ten years, a SNAP-27 still produced more than 90% of its initial output of 70 watts. The fuel cask from the SNAP-27 unit carried by the Apollo 13 mission currently lies in 20,000 feet (6,500 m) of water at the bottom of the Tonga Trench in the Pacific Ocean. Enformable is focused on providing critical information about energy related topics for readers around the world. The functional goal of the project is to provide a user-friendly public resource, complete with database of supporting research materials and data.